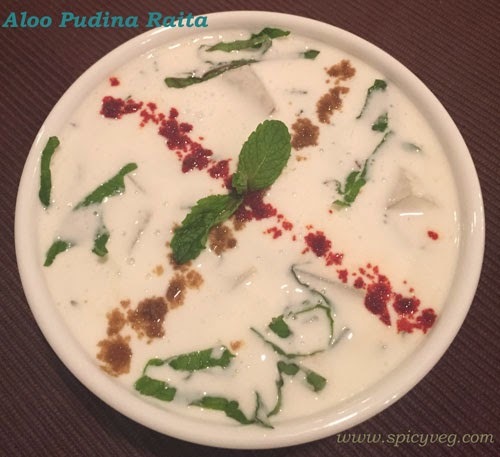 Aloo Pudina raita has a high cooling effect when served in summers. Aloo Pudina raita goes well with paranthas and pulaos. 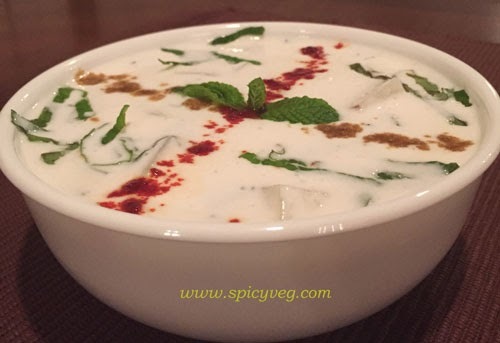 This raita simple and nutritious and a traditional Indian side dish that is cool and delightful especially with spicy curries,the most popular and common raita in indian cuisine, very easy to make and taste best when served chilled. 1.Boil the potato and cut into small pieces. 2.In a bowl add youghurt,boilded potato pieces,finely chopped mint ,salt and mix well to the desired consistency. 3.Garnish with jeerapowder and red chilli powder. 4.Serve chilled with choice of rotis and pulaos.